Please refer to our stock # ll1 when inquiring. This stunning Chinese export silver bracelet has a wearable length of 7 3/8" long x 1 1/8" wide. 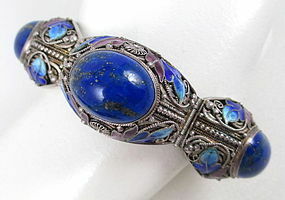 It is intricately made from filigree sterling silver and has three large 22 x 16mm lapis lazuli cabochons. The bracelet surface has detailed cobalt, powder blue, and lavender enamel leaves with a tiny amount of loss on 2 leaves. The tab closure works perfectly and the bracelet has an attached safety chain. It is signed "Silver" on the tab closure, and overall, it is in very good condition.